Just a quick food post for you today. I've done a few food related posts in the past, but they are mostly just fun and aren't actually healthy in any way shape or form ;) For example the giant cookie pizzas and spaghetti hotdog freakshow. 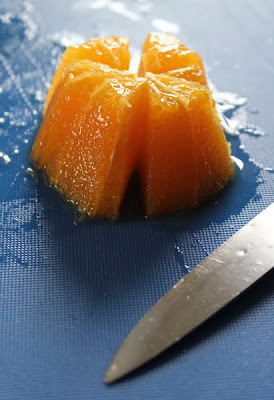 I did do a post about an orange treat a couple of years ago, but um, well, I filled an orange with Jello, so, er, not a terribly healthy treat either! Well, this time I've got a treat that is both cute, fun, and involves eating fresh fruit! 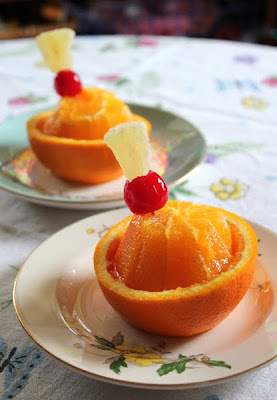 It's really cheap too, because you just need half an orange for each dessert and the kids love them because they look all dinky and tea partyish. 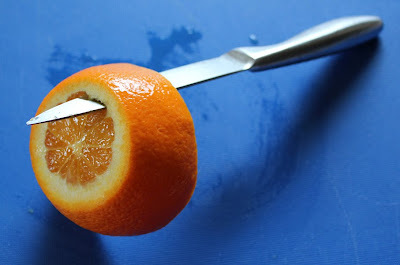 Chop your orange in half, so that you get the navel parts at the bottom center of each half. 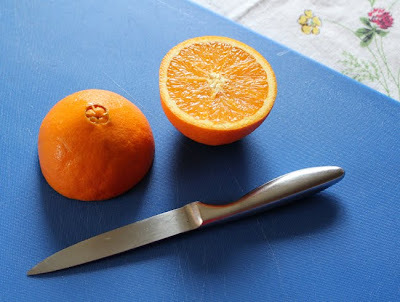 Now you will have a ring of peel that you can cut around with a knife to extract the edible part of the orange inside. This is the trickiest part and really it's not tricky at all. 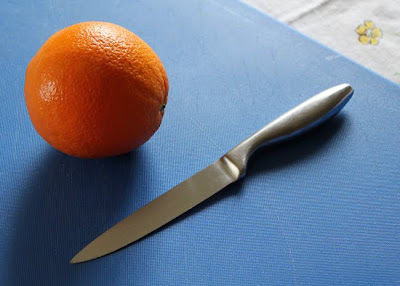 You just want to insert your knife at the edge of the pith and carefully rotate the orange on the chopping board to cut out it's center, leaving the peel in a complete ring. Sit this ring with the wide side up (it's going to make the little bowl for the orange treat to sit in). 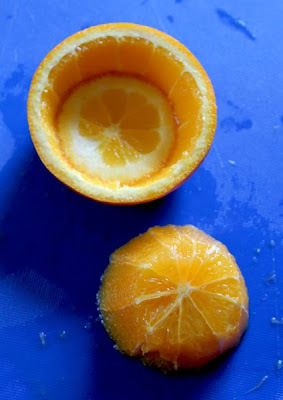 Then turn the little base bit that you cut off upside down and pop it into the ring to make the bottom of the peel bowl. 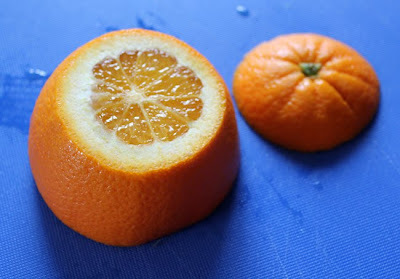 Now flip the edible part of the orange you cut out over so that it's widest flat surface is on the chopping board. 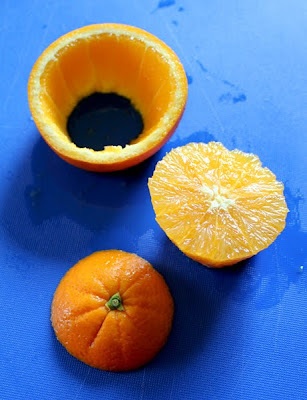 Cut it into six sections with your knife and pick it all up and place it into the peel bowl that you have made. 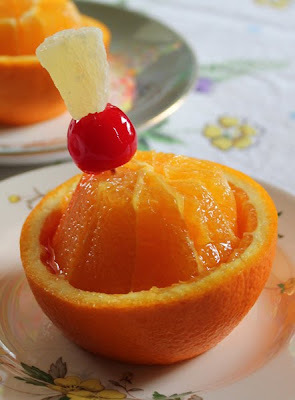 Then you get to decide how much of a treat you want it to be ;) I let my kids use a cocktail stick to eat the orange pieces because they are five and six years old, so aren't likely to hurt themselves with them, but I'd give a smaller kid a little fork. The kids like a bit of dried pineapple and a marachino cherry with theirs. I don't know if your kids are anything like mine, but if my kids asked if there was dessert and I came back with "Why yes! 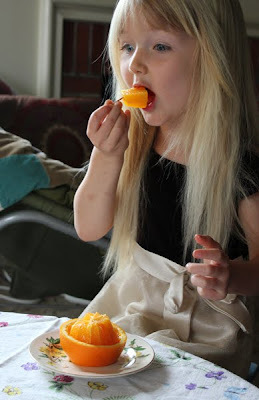 Dessert today is half an orange!" 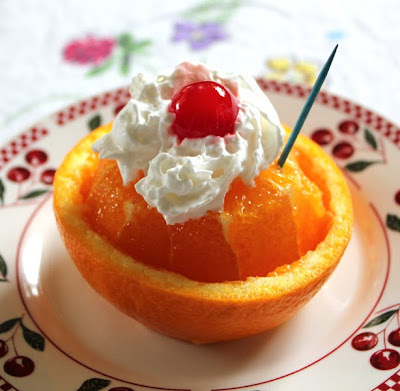 I would be met with incredulous stares and likely be informed that half an orange wasn't a kid approved dessert, but they totally go for it when it's presented in this cute way and it only takes about 30 seconds to make each one. 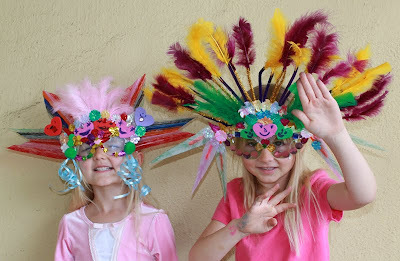 We made some Mardi Gras masks over the weekend out of our left over craft supplies and some stuff that was in the recycling bin. If you want to read the entire tutorial then pop over to the post on Alpha Mom, here to read about it and see all the photos. If you're more of the Pancake Day type than the Mardi Gras type then here's a link to the first ever post I wrote on Filth Wizardry back in 2008, showing the pancake art the kids love so much. Now that they are older and we have mustard bottles, they are capable of making their own squiggly pancake drawings. Rainbow collage for the pot of gold to go at the end of.